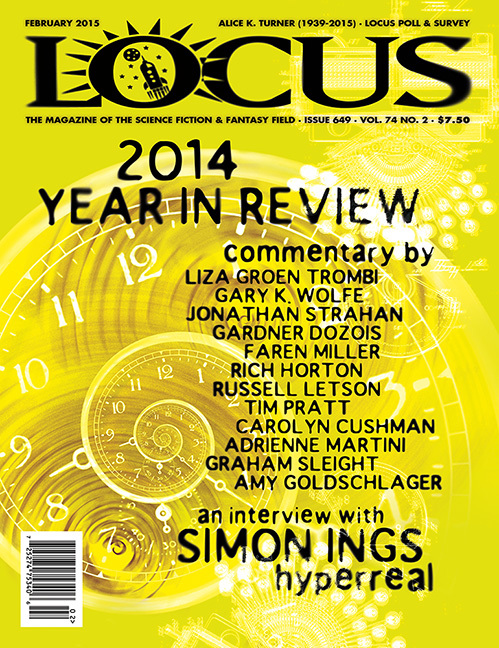 As usual the February issue of Locus Magazine includes its annual Recommended Reading List, covering books and stories published over the previous calendar year. Compiled by the magazine’s editors, reviewers and a panel of outside critics, it always makes for fascinating reading, and this year’s list, which includes a number of books and stories I have read and would heartily recommend (David Mitchell’s The Bone Clocks, Garth Nix’s Clariel, Adam Roberts’ Bête, Katherine Addison’s The Goblin Emperor, Ann Leckie’s Ancillary Sword, William Gibson’s The Peripheral) and a number I haven’t but I’m looking forward to a lot (Rjurik Davidson’s Unwrapped Sky, Ben Peek’s The Godless, Nina Allan’s The Race) is no exception. At a personal level though I was delighted to discover my story, ‘The Changeling’, which was published in Jonathan Strahan’s Fearsome Magics (which also gets a mention in the Recommended Anthologies list) included in the list of Recommended Novelettes. You can read the full list of recommended books and stories over at Locus. And if you’d like to read ‘The Changeling’ you can pick up a copy of Fearsome Magics (which also features stories by Garth Nix, Karin Tidbeck, Kaaron Warren, Frances Hardinge, Isobelle Carmody and a bunch of other excellent people) from online and bricks and mortar retailers or through your favourite ebook retailer.